Free Backlink Checker Tools | If you are looking for some genuine websites of free backlink checker tools then you are at right place because here I am going to share with you best free backlink checker websites which will help you in link building and grow faster in 2019. 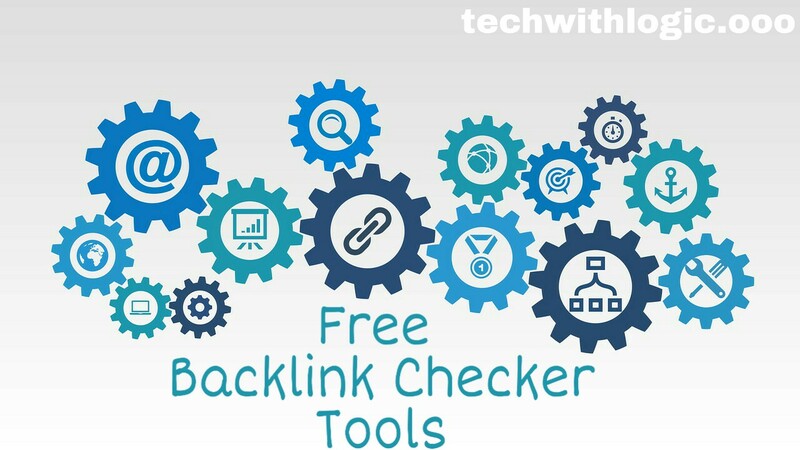 Hey Guys, My name is Lokesh from Tech With Logic and here in this article today I am going to tell you about Best Free Backlink Checker Tools in 2019. What are backlink checker tools? Guys, link building is the most important part of SEO. You already know that you have to do proper SEO to rank #1 in SERP. You have to make links of your website or your article in other websites, which is called backlink and the more dofollow backlinks you have the higher you will rank in SERP. So, to make backlinks you have to find those websites which give you High Pr Dofollow Backlink and it is very difficult to find a website who passes on all your conditions. This is why there are backlink checker tools, these backlink checker tools help you to find websites which gives you high pr do follow backlink by just a click. All you need to do is just paste your competitor website 's link in backlink checker tools and these tools will analyze that website and tell you from where that website is getting backlinks from and after getting that list you can easily create a backlink on those websites just like your competitor did. I hope you will understand what are backlink checker tools. Guys, there are two types of backlink checker tools, First is Paid Backlink Checker Tools and Second is Free Backlink Checker Tools. As you can see from their name Paid ones gives you more information than the free backlink checker tools, but free backlink checker tools are also useful especially for those people who can not afford the paid backlink checker tools because the paid tools are much costly and if you are a newbie in blogging then you should first use the free tools and later if you can afford the paid tools then you can shift to them. Paid tools like Ahrefs, Moz, Semrush costs up to 100$ per Month which is too costly for a newbie who doesn't even have much knowledge about SEO. Paid Backlink checker tools allow you to analyze any website on the internet and you can check anything about that website not only backlink you can check their keywords and domain authority etc. In Free Seo tools you have limitations while exploring any website like you can check up to 100 backlinks of any website and they don't tell you more about that particular website etc. So, this is what Paid and Free Backlink checker tools, still guys I want to tell you that if You are new in blogging then you should work on those Free backlink checker tools which i am going to tell you below because they are very helpful and even I am using them. Guys, here I am going to tell you about top 3 free backlink checker tools which will very useful for you. There are a lot of free backlink checker tools in the market but I am going to tell you about the Best Free Backlink Checker Tools which I also use for Link Building and for SEO and also recommend you to use them because not everyone can afford paid tools and these free tools are providing almost all the features of the paid tools. Guys, this is the best free Seo Tools Website in the market. This website not only allows you to check backlink of any website for free but also lets you explore any website for free which ahrefs tool is providing for 100$ per month. All you have to do is just create an account on seoreviewtools.com and paste any URL and you will be shocked that how much tools this website is providing. Guys, this is also the best free seo tool website. you can check up to 100 backlinks of any website for free and you can use their other tools also like keyword researching, da checker, broken link checker etc. Guys, this is one of the biggest SEO tools website in the market. It has almost every Seo tools and the important thing is it is free. So, you can use it easily and check backlinks of any website for free.